For when you want your design to sparkle like your imagination! Five different glitter products plus a crazy amount of colors equals endless possibilities! 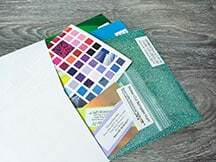 Browse our glitter products to find what’s right for your project!